John Moore has three children: Kevin, Traci and Bradley, and is married to the former Robin Bradley. 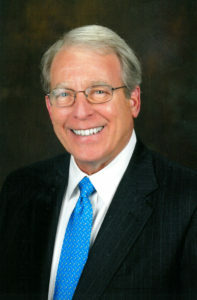 John Moore founded the law firm in January of 1984, though he has been practicing law in Cobb County since 1970. John is an active member, and past president, of the Cobb County Bar Association and is a member of the State Bar of Georgia where he has previously served on the Board of Governors. He is a former chairman of the Board of Bar Examiners and is a former member of the Chief Justice’s Commission on Professionalism. Recognized in the 2017 Best Lawyers in America list in the specialties of Land Use & Zoning Law, Litigation – Land Use and Zoning, and Real Estate Law. Has been recognized by his peers since 2007. Recognized as one of the Top Lawyers in GA for 2016 by Martindale-Hubbell for Ethical Standards and Legal Ability. Recognized in the 2016 Best Lawyers in America list in the specialties of Land Use & Zoning Law and Real Estate Law. Recognized in the 2007 Best Lawyers in America list in the specialties of Land Use & Zoning Law and Real Estate Law. Named to Atlanta Magazine’s 2008 Georgia Super Lawyers list as one of the Top Lawyers in Georgia for Real Estate. The Cobb County Bar selected John Moore as the 2008 recipient of the Bobby Cleveland Professionalism Award. This award recognizes the Cobb lawyer who best exemplifies the highest level of professionalism in the practice of law. Selected as one of The Best Lawyers in America for 2009, 2010, 2011 and 2012 in the specialties of Land Use & Zoning Law and Real Estate Law and will appear in the 2012 edition of Georgia’s Best Lawyers published by Best Lawyers. Selected as a 2013 Top Rated Lawyer in Land Use and Zoning. Selected as a 2013 Top Rated Lawyer in Energy Law, Environmental Law and Land Use Law. Recognized in the 2009/2010 Edition of The Global Directory of Who’s Who which recognizes and selects key executives, professionals and organizations in all disciplines and industries for outstanding business and professional achievements. Selected for inclusion in the 2010, 2011 and 2012 Georgia Super Lawyer’s List by Georgia Super Lawyers Magazine as well as selected in the May 2010 Super Lawyer’s Corporate Counsel Edition. Recognized as one of the Top Lawyers in GA for 2014 as published in Atlanta Magazine. Recognized as a Top 25 Law Firm as published in Atlanta Business Chronicle. Recognized as America’s Most Honored Professional Top 1% by The American Registry.